Numbers, so central to the game of golf, don’t leave room for interpretations. Definitive in nature, they are hard and fast and don’t often invoke passionate conversation about their artistic sides — at least not like the golf swing. Ah, now there’s a topic that generates endless debates, because unlike numbers, the golf swing isn’t black and white. It can be viewed from dozens of vantage points, although nearly everyone would agree that one player seemed to present the most pleasing sight of all: Steve Elkington. With the Aussie, there was an uncanny mixture of technique and tempo. Brad Faxon told reporters after Elkington steamrolled the field at THE PLAYERS Championship 1997 that having technique is one thing, having tempo another, but mixing them so fluidly is where Elkington had cornered the market. With rounds of 66-69-68-69, Elkington finished at 16-under 272 to establish THE PLAYERS record for margin of victory, seven strokes over Scott Hoch, who stumbled home with a closing 74. Unlike his first win in THE PLAYERS when he prevailed by just one in 1991, Elkington left everyone in his dust — an extraordinary feat given the depth of talent. Elkington’s pride was well grounded, for each of the top 50 names in the Official World Golf Ranking teed it up at THE PLAYERS Stadium Course at TPC Sawgrass. One name shined brighter than them all — with his score and his swing. 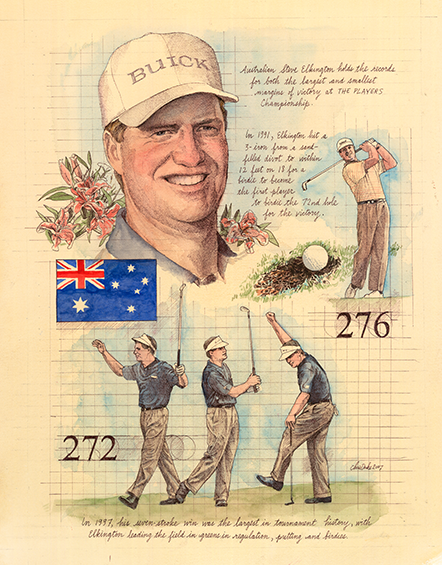 Returning to the scene of his most famous victory up until that point, THE PLAYERS Championship of 1991, Australian Steve Elkington blew the field away in a dominant wire-to-wire masterclass to claim THE PLAYERS Championship in 1997. Closing with a 69 for a 16-under-par 272, Elkington set a new tournament record of a seven-stroke victory over Scott Hoch.